This is an entry-level marketing position that will champion work across many lines of business at Faithlife. The work will vary from tactical tasks, such as updating a website or building a landing page from a template, to the coordination of marketing programs, and the execution of primarily digital marketing communication. This person is responsible for ensuring marketing programs are delivered on time and on budget against the marketing strategies developed throughout the company. They will ensure clear communication with all stakeholders so they understand the status and scope of each project, and what the next steps are. Furthermore, it is their responsibility to coordinate and communicate between various parts of the company involved with each project. Responsible successful implementation and management of end-to-end marketing projects. Evaluates the strategy of each program and identifies and suggests areas for improvement. Ensures stakeholders understand project milestones and how (at any given time) the team is executing against plan, identifying any areas for optimization or additional messaging opportunities. Keep marketing calendars, briefs, contact strategies, etc. updated and available in Faithlife’s project management systems. Project manages both planned campaigns of all sizes and tight-turnaround projects that capitalize on unplanned opportunities. Takes direction from the team manager with regards to marketing projects, workload, and identifying ways to improve skill set. Work with ‘requesters’ to fully understand the scope of each program, appropriate level of resources, and appropriate schedule for all projects. Responds timely to marketing requests, acting as consultant to identify appropriate marketing solution for the business challenge. Gathers input information including business challenge, current landscape, outcome/end goal, budget, discount codes, customer pain points and timing. Sets clear expectations with stakeholders regarding timing, resources and budgets. Understands specifics of product details to ensure all work provides clear, accurate and compliant information. Work with marketing team lead, and line of business owner to ensure work is delivered on appropriate schedule and through appropriate channels. Responsible for establishing project work schedule in JIRA and maintaining the schedule. Maps key milestones to ensure key stakeholders remain on track. Responsible for reviewing input from all stakeholders, negotiating to arrive at appropriate feedback and final approvals. Lead internal project status meetings and ongoing project schedule updates. Work with Faithlife’s internal design and communication teams to ensure all collateral is available in proper formats and through proper channels for sales, customer service and marketing teams. Responsible for building responsive landing pages for projects from templates using basic HTML & CSS. Be proficient using a wide variety of marketing tools like Google Analytics, email automation tools, Google Docs, etc. Sign-on Bonus May Apply to Applicants! Sears Home Service, the home solutions division of Sears Holdings Corporation, is the nation's largest product repair service provider, providing more than 52 million solutions for homeowners annually. We are looking for an experienced In-Home Service Technician with a great attitude and the ability to help customers with their appliance repairs. As a Service Technician, you will have the opportunity to repair Washers and Dryers, Gas and Electric Stoves, Microwave Ovens, Dishwashers, Trash Compactors, Garbage Disposers, Refrigeration Appliances and other home appliances in the customers’ homes. We provide competitive pay and ongoing training in a collaborative, supportive, and team-oriented setting. In the Service Technician role, you will enjoy working independently as a representative of a leading retailer and in-home service provider. We offer company-paid life insurance, vacation time, paid national holidays, medical, dental, and vision insurance. DeWaard & Bode, Whatcom, Skagit and the Island counties largest appliance retailer is hiring! Our growing business is actively seeking a full-time Appliance Technician to expand our Service Department. With increasing demand, we have a need for qualified, skilled technicians to support our customers! Looking for a company to grow with? WE OFFER COMPETITIVE SALARY, MATCHING 401K PLANS, GROWTH OPPORTUNITIES, WA STATE CERTIFICATIONS, PAID TRAINING and so much more. Out of the area (city, state)? If you are a current certified appliance technician [WA State 07(d) license] WE WILL HELP PAY FOR YOUR MOVING EXPENSES! The major appliance industry has been rapidly evolving to be on the forefront of leading technology and design. While the appliance technician still works hands-on with machines, they must be technologically savvy and in tune with the digital age in addition to being mechanically inclined. 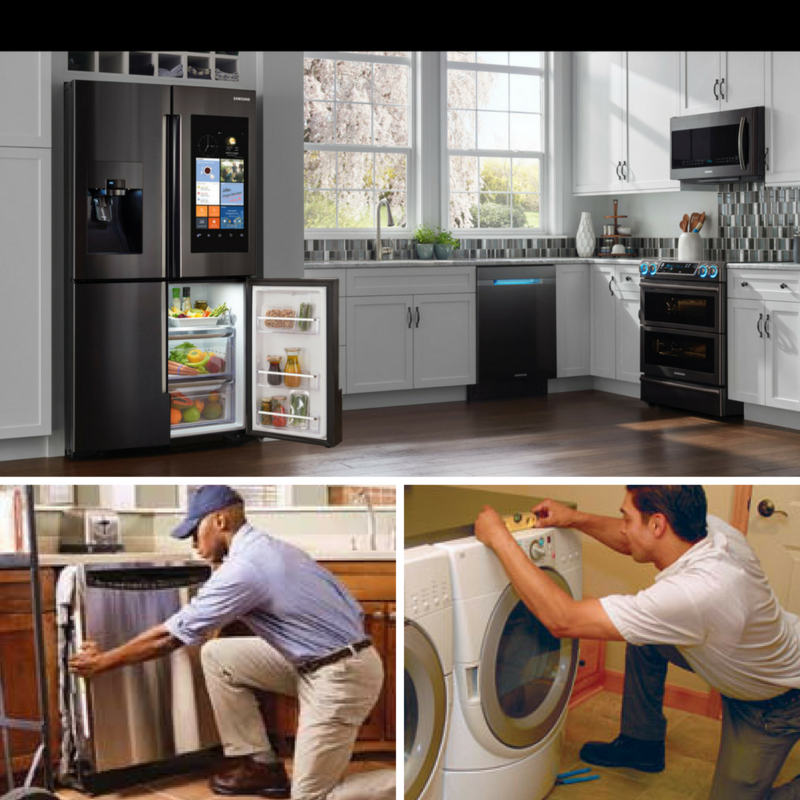 As one of Washington's premier major appliance retailers, DeWaard & Bode employs the largest Service Technician team in Whatcom & Skagit counties that sets the standard in quality customer care, comprehensive parts & service solutions, and professionalism. Our technicians are working with innovative and progressive technology from brands like Whirlpool, LG, Samsung, GE, Bosch, Wolf, and many more highlighting the need for skilled professionals entering the trade. Job responsibilities include (but not limited to): Identifying issues/problems with appliances, repairing appliances in customer's homes, interacting/communicating with customers in a professional manner, and keeping detailed and accurate logs. The typical day as an appliance technician will include working in the shop on repairs, parts/service, customization; driving locally in a company vehicle to customer's homes; diagnosing, reporting and repairing appliance issues; and interacting with customers to coordinate service appointments and resolve customer concerns. Qualified candidates for this position are professional, have strong interpersonal communication skills, is mechanically inclined, is technologically inclined, has HVAC experience, electrical experience, or a registered WA State 07(d) license. Apply today and jump start your new career with DeWaard & Bode! Our company will train you in our fully functioning shop working on old and new appliances, enhancing technical skills, and preparing you for workplace scenarios. Must be able to pass a drug test upon hire. Consistent, full-time (8hrsx5sdys) schedule, no Sundays! We will help you pay for moving expenses if out of area! CHS Northwest has an exciting opportunity in our Bellingham Country Store. We are looking for a Full Time Receiver to verify and maintain the accuracy of all incoming and outgoing inventory at the retail stores to improve the cooperative's efficiency and help achieve the cooperative's mission and goals. You must have excellent communication skills, both verbal and written, as well as the ability to problem solve, prioritize and make sound decisions. Having a pleasant attitude, being helpful and customer focused is essential. Verify all incoming freight off of receiving documents and packing slips as well as check freight against purchase orders. This includes freight from outside vendors as well as from the distribution center and other departments. Hold freight from being sold until it has been received in accordance with proper procedures. Report receiving or invoice discrepancies to the personnel responsible for the order as well as the central accounts payable clerk. Assist in resolving these discrepancies. Verify all freight leaving the store as part of a store transfer. Watch for and recognize security risks and thefts. Assist in preventing or handling these situations. Examine returned merchandise; work with retail staff and vendors for credits if applicable. Coordinate product transfers to minimize delays in shipment to other locations. Work with inventory control clerk to maintain inventories and resolve variances where applicable. Maintain positive, open communication with management, distribution center, accounts payable clerks and retail store staff. Participate in monthly staff meeting and communicate information and issues on vendors, receiving and invoicing. Communicate inventory and vendor concerns/information to management. Promptly assess and respond to customer inquiries and complaints and direct customers to the proper personnel when necessary. Ability to operate warehouse/stockroom equipment as needed. From e-commerce to mobile wallets and chip card acceptance, Elavon helps businesses, small and large, accept all payment types – and reap the benefits at the end of the day. Whether they need a simple or sophisticated payment solution, we've got them covered. For 25 years, we've helped more than one million customers around the world grow their business through payments. Our flexible, secure and innovative payment solutions help businesses attract and keep customers, develop partner relationships, process payments and simplify operations. We're backed by the strength and stability of U.S. Bank, the fifth largest commercial bank in the U.S.
Faithlife is looking for a New Products Marketing Specialist with several years of digital marketing experience to focus on bringing to market one of our newest SaaS products, Faithlife Sites. This individual will work with the New Products Team to focus on bringing this subscription product to market and then to scale it. As the Marketing Product Specialist for Sites, you’ll help manage and coordinate the marketing of the product. You’ll coordinate with the sales and promotions teams to ensure the product is sold and promoted appropriately and beneficially, and you’ll work with customer services and development to identify and manage product updates. You will be constantly testing product updates and marketing programs and analyzing data to drive decisions. You will build strong feedback loops to determine customer reactions to and sales implications of product and marketing updates. You thrive in a fast-paced environment and don’t mind when projects are pivoted. You enjoy helping create the roadmap and adapting it based on customer feedback and reactions. You are goal-driven and have an entrepreneurial drive. Lead the marketing and project management of creating the marketing website, automated onboarding programs, and evergreen marketing funnels for the Faithlife Sites. You will work with designers, product managers, writers, and other teams to execute on these initiatives. Work cross-functionally with the marketing department to create integrated marketing campaigns across multiple channels including: email, advertising, blog, app messaging, social media, and more. Build feedback loops to analyze how customers react to and interaction with product changes and marketing programs. Describe the product functionality in a way that enables support team to develop materials in support of the product. Work with marketing communications team to promote new features and upsells. Use data and customer feedback to provide a voice in product engineering and architecture. Update and maintain transactional emails and product pages. Good understanding of church business operations. Understanding a church’s operational goals, particularly around website building and church management solutions, and a church’s challenges and concerns. Experienced with software as a service products and subscription marketing. Experienced with creating go-to-market strategies and taking new products to market preferred. History of managing multiple projects for a variety of business stakeholders. Project management experience and/or understanding of PM fundamentals. Solid understanding of HTML and CSS a plus. Experienced. You have at least 3- 5 years’ experience in a digital marketing role with several years’ experience of managing SaaS products. Knowledgeable. You have a broad knowledge of the Christian market and what drives purchasing decisions of church leadership. The company launched its core product, Logos Bible Software, in 1992 to facilitate Christian Bible study for prosumers (pastors, scholars and thought leaders). The company is profitable with over 400,000 customers and a track record of successful product launches. In recent years the company has begun to diversify its offering to incorporate more multi-media content and new SaaS and mobile applications for churches and consumers. The Christian market is underserved by the traditional providers of content and collaboration tools. Comprised of 6 million prosumers, 3 million churches, and over 2 billion consumers, these faith-oriented users require tailored functionality, selective content, and secure communications. Today, users must find appropriate content and then piece together a conversation and workflows among their community, which is laborious and ineffective. Faithlife’s strategy is to fulfill these market needs and become the platform provider. Faithlife products make life simpler and more convenient while providing education across the devices that users love to use. The company’s products save time for users while simultaneously providing deeper content and connecting people. Its integrated suite of software and rich content enables a pastor, teacher, or church leader to easily search extensive libraries, develop insight, and share it with their community. Beyond their extraordinary effectiveness, Faithlife products are interesting, fun and engaging with embedded communications that create a networking effect across every type of user. Faithlife is focused on becoming the premier platform serving the Christian market across multiple customer segments, products, and digital content categories. As a result, it is seeking new leaders to join the team and take the company to the next level of growth, capability, and market position. This role will work under the direction of the Marketing Analytics Manager to develop strategies around the systems, data, and tooling of the Analytics team. The role will be focused on optimizing, analyzing, and documenting data from multiple sources. You will work cross-functionally with other teams to support lead processing and demand funnel optimization. You will be responsible for creating reports that provide consistent and accessible views of the data needed to drive actionable change within the organization. In compliance with federal law, all persons hired will be required to verify identity and eligibility to work in the United States and to complete the required employment eligibility verification document form upon hire. Faithlife will not sponsor applicants for work visas. Under general supervision, controls the distribution of cards/dice during the game(s) on any given table in the Pit; determines proper amount of chips to be dispersed on customer buy-in or pay-off; teaches unskilled players the rules of the game, and provides a superior level of customer service to guests. Previous guest service experience and High School/GED required and/or an appropriate combination of both.